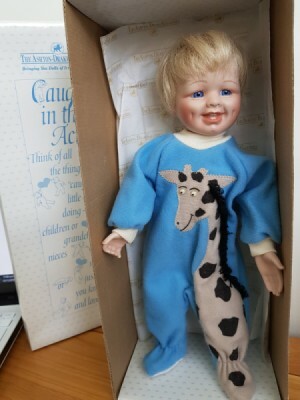 I was gifted a Ashton Drake Galleries doll. Could you please tell me the doll's value. The doll is the first issue in the "Caught in the Act" Collection from the "Catch Me If You Can!" The item was designed by doll artist Mary Tretter in an exclusive edition for the Ashton Drake Galleries. The doll is Little Stevie, I have the Certificate of Authenticity, the certified number on the certificate matches the number on the nape of the neck of the doll. The doll is in it's original presentation paper wrapping including the original box. All of the above mentioned are in excellent condition. As low as...bad typing... sorry!